This nonpoisonous, medium-sized snake is found mainly along the Minnesota, Mississippi, and St. Croix rivers, in open places that have rocky outcroppings. Although it may come in many color combinations, it always has black outlines around its blotchy markings. This distinctively marked snake is covered with blotches that range from reddish-brown to grayish-brown. The blotches are outlined with black. A light gray Y- or V-shaped pattern is located on the back of the neck. Typically, adult milk snakes range in length from 24 to 36 inches. 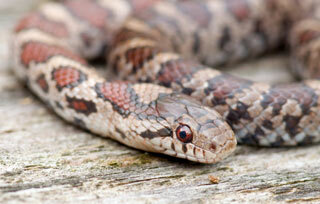 The milk snake hisses and shakes its tail when it is threatened. This may cause some people to confuse it with a rattlesnake. Milk snakes mate in spring or early summer. The female lays 8 to 12 eggs, which hatch in 6 to 9 weeks. The newly hatched young are 6 to 10 inches long.